Thallus: foliose, forming small to medium sized rosettes up to 3 cm wide, sometimes coalescing, adnate to loosely adnate, lobate lobes: dorsiventral, flattened to convex, 0.8-2 mm wide; tips: truncate to rotund, 0.3-0.9 mm wide upper surface: yellow to orange, smooth to shiny, sorediate soredia: powdery, marginal in horizontal crescent-shaped slits ('bird nests') medulla: white, reticulate, with short to elongate hyphae lower surface: white to yellow, somewhat wrinkled, rarely with short, white hapters Apothecia: rare, laminal, stipitate, up to 2.5 mm in diam. ; margin: initially smooth but often becoming sorediate and with cilia; disc: orange; epihymenium: brown, c. 10 µm thick hymenium: hyaline below, 50-110 µm tall; paraphyses: simple or branched, cylindrical, septate; hypothecium: hyaline to pale brown, 30-90 µm thick asci: clavate, 8-spored ascospores: ellipsoid, polarilocular, hyaline, 11.5-17 x 6-9 µm; septum: 2-5 µm wide Pycnidia: common, immersed to protruding, darker than upper surface conidia: bacilliform, 2-3.6(-4.5) x 1-1.5 µm Spot tests: upper surface K+ purple, C-, KC-, P- Secondary metabolites: parietin (major), fallacinal (major), emodin, teloschistin (major) and parietinic acid. Habitat and ecology: on bark, rarely rock or detritus, in rather humid (to dry, but not very dry) microclimates World distribution: widespread in temperate regions around the globe Sonoran distribution: widespread except for extremely dry areas. Notes: Xanthomendoza fallax is characterized by the 'bird nest' soralia, which are formed when the upper and lower cortex split and separate. Crescent shaped openings then expose the soredia produced from the medullary layer (see Poelt and Petutschnig 1992). 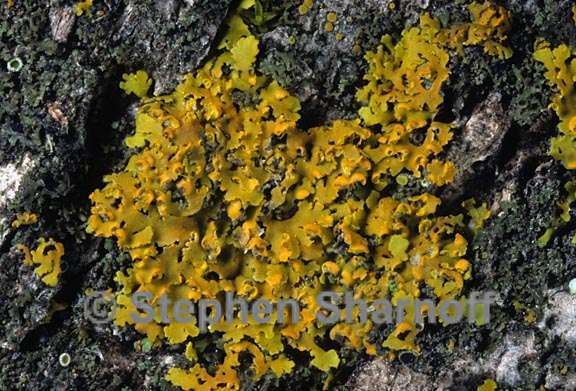 Xanthomendoza ulophyllodes is similar to X. fallax in many respects, but instead of soredia it produces blastidia directly from lobe margins, and frequently also on the upper surface of the thallus. In addition, the thallus of X. fallax is flatter and more adnate to the substrate, while a higher proportion of especially the central lobes of X. ulophyllodes are semi-erect, giving the thallus a more loosely adnate appearance. Xanthomendoza fulva is smaller, has narrower lobes, less frequent rhizines, and is mostly deeper orange pigmented. The upper cortex around the soralia sometimes persists, and makes them resemble the 'bird nest' soralia of X. fallax. In X. fulva, they are much smaller, however, and usually occur at the tips of slightly raised lobes.